Once it was decided to run a turbocharger, a list of components was made. Slowly but surly the list was reviewed and each item meticulously researched. All products have to be well made, performance capable and affordable. None of the parts used in Turbo Camaro are the best of the best, but they are likely the best bang for your buck. Take the carburetor hat (bonnet or plenum) for example. 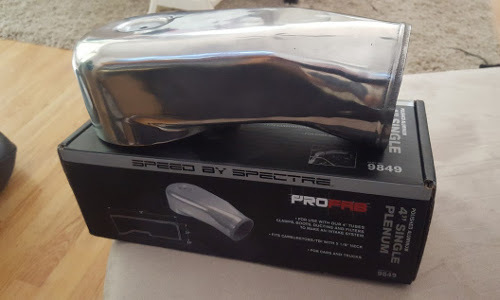 The purchased part is a Spectre 9849 single intake regular height hat. It is 3.5" tall, 9" long and has a 4" intake and it fits on any carburetor with a 5-1/8" inlet. It should fit nicely on the Holley 4776 600CFM DP with mechanical secondaries. 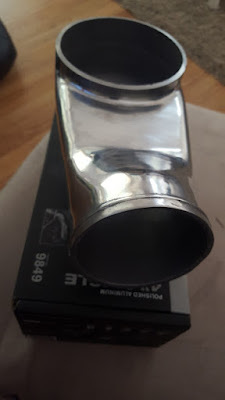 It's polished aluminium and quite hefty. The size is good but like any part mounting to the top of your engine, be sure you have enough clearance between it and the hood. Overall it feels like a high quality part but at $99US it's not cheap for what it is. Hopefully the profit made on these is paying off all the R&D staff as they probably cost very little to manufacture. Interestingly enough, purchasing a carb hat isn't that simple. They come in different sizes and finishes as well as with, or without an internal divider. Not to mention several manufactures (like Spectre) offer low profile versions for those with short hood clearance. These are just the physical characteristics, what about the actual results of these things? adapter to be able to use that nut on this plenum. Can you just buy anything that fits and have it work the same as the most expensive one? The answer to that is no. A $40 hat made out of an old cast iron pot on eBay is not going to work as well as the $280 Extreme Velocity (EV) Pro series. The Extreme Velocity site claims to make more power than any other hat on the market. So, lets break this down for a second. EV's dyno sheets show an average overall power increase of 5% over competitors using their hat. The Spectre hat will likely run Turbo Camaro to 350HP for it's cost of $99. If the EV gets an aditional 5%, that's almost 18HP. Each extra HP will cost $10 for a total of $180. That's not the best deal but it really depends on your project. For a little Chevy 250 with 350HP, it might not be worth it as 18HP may only be slightly noticeable. If you're building a 800HP drag car, the 5% gain is closer to 40HP and that could make all the difference spread over a quarter mile. The $180 price difference was enough to pay for most of the DevilsOwn Alcohol Injection kit, which should increase power 5-10% and help with detonation, air intake temperature and combustion chamber cleanliness. It's not always about how much an item is, but how you can spend your money efficiently. Spectre Hat hacked to clear valve cover. Needless to say, the eBay hats were laughable but fairly priced. The EV might be the best performer but not the best value while the Spectre hat as it's a quality part with no competition at its price point. The Spectre hat worked perfectly for the original build setup but upon installation of the turbocharger, the decision was made to have the pressurized piping cross over the valve cover. A riser was required in order to raise the Spectre hat up enough to clear the cover, but even then the downward angle of the hat opening hit the cover. approximately 1.5" of the hat was cut off to allow it to cross over the valve cover. With a silicone 4-3" reducer, the hat functions the same and now has clearance over the valve cover. There isn't much more we can say about the Spectre Hat. We still feel it could be a cheaper than it is, but it's by far the best hat available for the money, at least at the time we researched it. 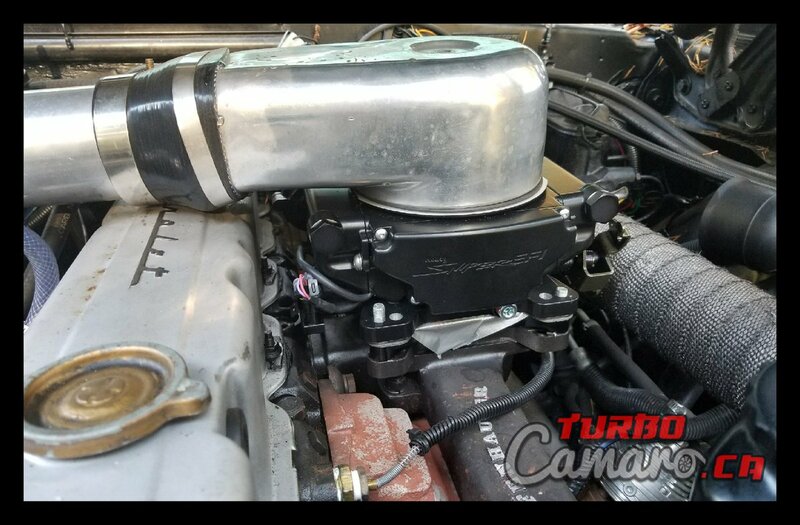 If you have any questions please feel free to contact us at turbochargedcamaro@gmail.com.